Po-Zu has brought a new look to Star Wars shoes since they acquired a Lucasfilm license. Before they brought Rey boots onto the scene, not many options existed for casual galactic footwear. And now their eco-friendly, made from sustainable materials offerings have expanded to include every kind of Rey shoe you can imagine, Chewbacca boots, sneakers covered in porgs, and their newest style, Han Solo sneakers. I'm sure they're designed to help you run away from Imperials at maximum speed. The style is inspired by Han's pants in A New Hope. 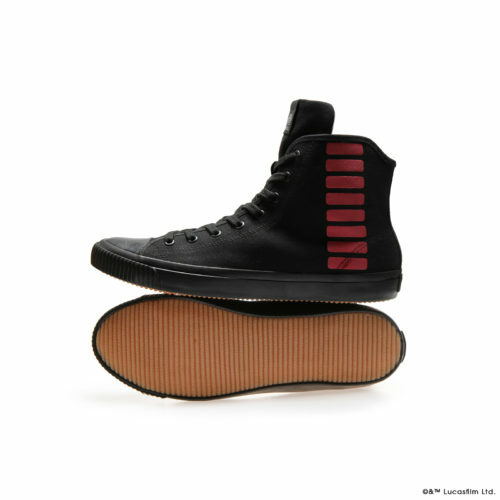 The high top sneakers have the iconic Corellian bloodstripes running down the side; it's a subtle design that will pair with more outfits than say, porg sneakers. And as someone who has looked up the precise measurements for those bloodstripes for cosplay purposes, Po-Zu clearly paid attention to all the details. View more pics of the rad smuggler sneakers in the gallery below. The Han Solo sneakers are available for pre-order on Po-Zu's site now. They'll be delivered in May, which means you might have them in time to wear to your first screening of Solo: A Star Wars Story. My fingers crossed that Po-Zu will also unveil some sparkly Lando Calrissian sneakers in the next month. Will you let your feet go solo, or will you order these sneakers? How many Star Wars sneakers do you have? Fly to the comments and let us know. Sneakers covered in porgs--not real ones. Kiki's Delivery Service fragrances and accessories.